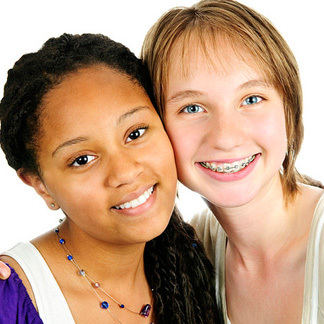 The American Association of Orthodontists recommends that children should have an orthodontic checkup by the age of 7. While there are still a large amount of baby teeth in the mouth, Dr. Therese will often be able to identify any problems with jaw growth and tooth development at that time. The first permanent molars and incisors have usually come in and crossbites, crowding and other skeletal problems will be noted. Parents will then become familiar with their child's potential orthodontic needs and can be advised when ideal treatment timing may begin. If no orthodontic treatment is necessary, Dr. Therese will place you on an orthodontic recall and will continue to evaluate growth and tooth eruption on a 6 or 12 month interval. In a smaller percentage of cases, early treatment (often called Phase I treatment) is deemed necessary. It is most often required when there are developing jaw or tooth eruption issues. When treatment begins early, the orthodontist can guide the growth of the jaw and incoming permanent teeth. Early treatment can also regulate the width of the upper and lower dental arches, gain space for permanent teeth, and avoid the need for permanent tooth extractions. It can also reduce the likelihood of impacted permanent teeth and correct certain oral habits such as thumb and finger sucking. In other words, in some cases, early treatment can simplify later treatment.